Readers Question: What is the difference between monetary and fiscal policy? They are both used to pursue policies of higher economic growth or controlling inflation. Influencing the supply of money. E.g. Policy of quantitative easing to increase the supply of money. The Central Bank may have an inflation target of 2%. If they feel inflation is going to go above the inflation target, due to economic growth being too quick, then they will increase interest rates. Higher interest rates increase borrowing costs and reduce consumer spending and investment, leading to lower aggregate demand and lower inflation. If the economy went into recession, the Central Bank would cut interest rates. In a recession, the government may decide to increase borrowing and spend more on infrastructure spending. The idea is that this increase in government spending creates an injection of money into the economy and helps to create jobs. There may also be a multiplier effect, where the initial injection into the economy causes a further round of higher spending. This increase in aggregate demand can help the economy to get out of recession. 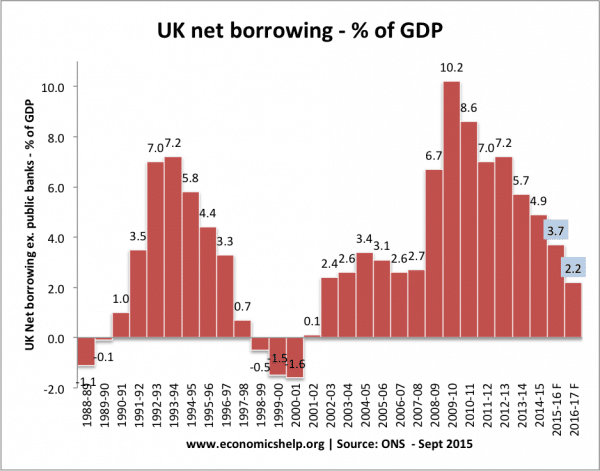 This shows that in 2009/10 the UK ran a budget deficit of 10% of GDP. This was caused by the recession and also the government’s attempt to provide a fiscal stimulus (VAT tax cut) to try and get the economy out of recession. If the government felt inflation was a problem, they could pursue deflationary fiscal policy (higher tax and lower spending) to reduce the rate of economic growth. Which is more effective monetary or fiscal policy? Fiscal policy can have more supply side effects on the wider economy. E.g. to reduce inflation – higher tax and lower spending would not be popular, and the government may be reluctant to pursue this. Also, lower spending could lead to reduced public services, and the higher income tax could create disincentives to work. Expansionary fiscal policy (e.g. more government spending) may lead to special interest groups pushing for spending which isn’t really helpful and then proves difficult to reduce when the recession is over. Monetary policy is quicker to implement. Interest rates can be set every month. A decision to increase government spending may take time to decide where to spend the money. However, the recent recession shows that monetary policy too can have many limitations. Targeting inflation is too narrow. During the period 2000-2007, inflation was low but central banks ignored an unsustainable boom in the housing market and bank lending. Liquidity trap. In a recession, cutting interest rates may prove insufficient to boost demand because banks don’t want to lend and consumers are too nervous to spend. Interest rates were cut from 5% to 0.5% in March 2009, but this didn’t solve recession in the UK. Even quantitative easing – creating money may be ineffective if banks just want to keep the extra money on their balance sheets. Government spending directly creates demand in the economy and can provide a kick-start to get the economy out of recession. Thus in a deep recession, relying on monetary policy alone, may be insufficient to restore equilibrium in the economy. In a liquidity trap, expansionary fiscal policy will not cause crowding out because the government is making use of surplus saving to inject demand into the economy. In a deep recession, expansionary fiscal policy may be important for confidence – if monetary policy has proved to be a failure. Part of Monetary policy, especially in the past, is control of the exchange rates and therefore value of the currency, which is worth noting. This was of course before there were floating exchange rates. It’s much more difficult to do it nowadays, but a devalued pound has been the possibly beneficial consequence of the recession. Surely increased government spending shifts demand rather than creates it? The money has to come from somewhere after all, and “thin air” is not one of the determinants of demand, at least last time I checked. Both policies are useful and effective. But all depends on the demand and supply curve of the economy. If the demand curve is flat, where money policy is no longer efffective, then we need fiscal policy. Government must spend money to move the demand and the economy. On other side, if demand curve is elastic to interest rates, normally monetary policy works…. both the monetory policy and the fisical policy are very effective to the development of a countries economics growth. The differences should be more specified.Anyway, both of these policies are needed to be implemented for the betterment of the economy. In this present economic dynamics, both fiscal and monetary policy should be applied to the economy sparingly, to ensure that the consequences of the application does not have longer detrimental effect on the economy. This present global economic situation is indeed unique, and due care must be taken in solving the problems we encounter. i appreciate the work done above.however,it could be better if more differences are shown. I agree with Ms. Evan Terese! Do you have project topics on Problems of Monetary and Fiscal Policies? Describe the difference between monetary and fiscal policy in the UK and explain how such policies can be used to achieve different macroeconomic government objectives? As economies continue to integrate due to globalisation and formally closed economies like India and China march toward total liberalisation, entrepreneurship is on the increase. A close analysis of developed and industrialised economies indicates a common denominator that stands out amongst all of them, which is the important role played by entrepreneurship and entrepreneurs in such economies. How entreprenuers impact an economy? Reich (2010, p. 1) argues that economic growth leads to increased prosperity in the developed, emerging and developing world. Why do you think growth is good?